Sky TV says it has made a significant step towards bringing 3D television to British viewers. The satellite broadcaster says it has successfully tested the delivery of 3D programming to a domestic television, via a high-definition set-top box. Sky has been filming a number of events using 3D cameras over recent months. Such broadcasts would require the use of 3D televisions, not yet available in UK stores, and viewers would need to wear 3D polarising glasses. 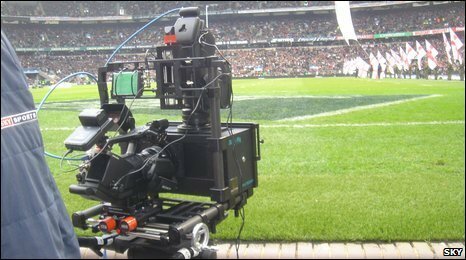 Earlier this year BBC engineers broadcast a Six Nations rugby union international in 3D to an audience at a theatre in London. 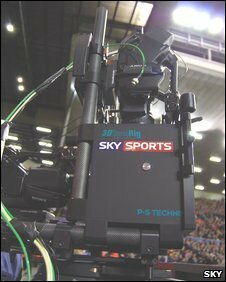 Sky says it has gone further by showing that 3D could be delivered into homes, straight to its Sky+HD set-top box, without much difficulty. Sky is stressing it is not making a product launch, but producing a technological demonstration. "We have shown it is a technical reality," Sky's director of strategic product development, Gerry O'Sullivan, told BBC News. "Now we have to find a way to bring it to viewers." At a demonstration at its West London headquarters, the company showed clips from programmes it had filmed in 3D, including a Ricky Hatton boxing match, a rugby union international and an episode of Gladiators. Mr O'Sullivan said major TV manufacturers were beginning to look at building 3D sets and at January's Consumer Electronics Show, in Las Vegas, a number of prototypes are expected to be on display. He explained that for broadcasters, the move to 3D would not be anything like as expensive as the investment the industry had made in high-definition television. "It's not hugely costly," he explained, "because it piggybacks on the investment in HD." Hollywood is beginning to invest heavily in 3D movie production and in Japan some television channels are already broadcasting in 3D. It is a technology that first surfaced in the 1950s, but modern digital technology has brought new interest from producers and manufacturers. Mr O'Sullivan dismissed the idea that it would appeal only to a small minority of viewers. "I heard HD described as a niche product," he said. "Now we've got nearly 600,000 HD customers."